Two thousand years ago, Roman legionnaires lugged 100-pound packs into battle. A lot has changed since then, but technology hasn't really reduced an infantryman's load. On the battlefield, mobility is critical—but a typical, modern Marine may shoulder an 80-pound backpack containing 20 pounds of back-up batteries for an array of electronics. When soldiers or supply convoys are forced to move slowly on repeated trips, they can become "targets of choice" for enemy combatants. 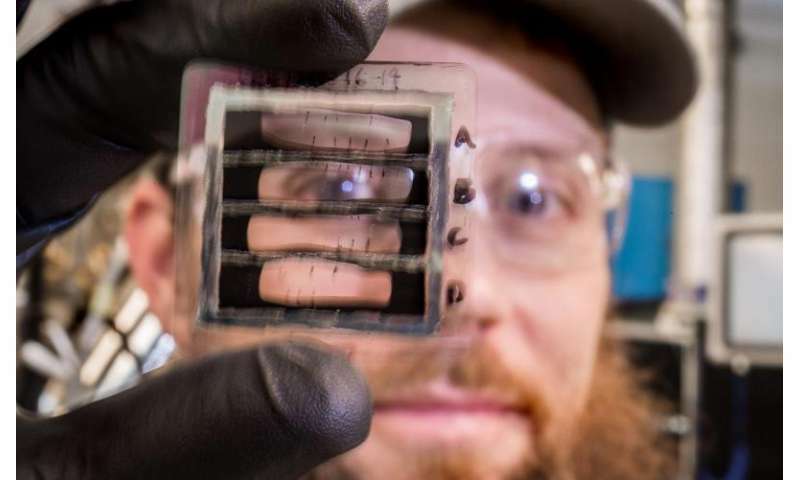 Because of this, the Energy Department and Department of Defense are looking for ways to ease such heavy burdens, and a team of researchers at the National Renewable Energy Laboratory (NREL) is exploring novel approaches for making renewable power sources lighter. Photovoltaic (PV) cells are the military's choice to power remote bases, but the ones it uses are not only large and inflexible, they aren't very efficient. Last summer, NREL embarked on a $1.5 million, three-year research and development contract with the Office of Naval Research to explore making lightweight solar cells. In this work, the journey has been marked by fundamental science—and creative thinking. "What if we could grow solar cells on the same heavy substrate we use in the standard high-efficiency, low-cost polycrystalline processes?" asked Matthew Reese, an NREL staff scientist in PV research. Afterwards, researchers could transfer the high-efficiency cadmium telluride (CdTe) or copper indium gallium selenide cells to lighter-weight packaging—trimming the weight of the cells. Thin-film solar cells, grown on substrates such as stainless steel, titanium foils, and polyimide, produce flexible products that are ideal for solar blankets and tarps. As such, the thin films are more portable—but they also typically lack the higher efficiency of cells grown on thick-glass substrates. Reese's challenge has been to combine the best of both. The solution: a novel "lift-off" of a high-efficiency cell that could then be repackaged on thin film. The seed of this idea began around four years ago, when Reese was working with NREL's Teresa Barnes on a research project funded by the Energy Department's Foundational Program to Advance Cell Efficiency (F-PACE). F-PACE supports PV cell efficiency, and the NREL team was making lightweight CdTe solar cells on flexible glass. "When you grow a CdTe cell, you need to grow it for highest efficiency on a transparent substrate," Reese said. In turn, "the order in which you grow the layers of a cell is critical. For CdTe, the substrate has to be transparent, and that limits choices" because CdTe requires high temperatures. Plastics, therefore, won't work. Although growing CdTe cells on glass, which can withstand high temperatures, was promising, this approach had a drawback. Even flexible glass can shatter, making it unreliable for certain military applications. But researchers felt that retreating to low-efficiency, flexible cells wasn't an option. The military is interested in high specific power, which means it wants as many watts as it can get out of the minimum amount of weight. To hit that goal, many researchers think of using III-V multijunction solar cells, the most-efficient PV materials. "But those cells are too expensive," Reese said. "Even the military can't afford that option." When work finished about a year ago on the F-PACE efficiency project, Reese and his colleagues continued to think about ways to combine high-efficiency PV with robust packaging that was lightweight. After gaining support from NREL through a Fiscal Year 2016 Laboratory Directed Research and Development project headed by scientist Miguel Contreras, the team wrote a follow-up white paper. The project drew interest from the Office of Naval Research—but the Navy wasn't looking for a packaging makeover. Project leaders wanted an approach with the highest efficiency, and therefore, with high specific power. "We thought for a little bit, and then it occurred to me. We'd done this diagnostic test by delaminating CdTe cells," Reese said, referring to a way of lifting a cell off a substrate to remove it. "Maybe we really could have the best of both worlds." Researchers could do all of the standard higher-temperature processing on the rigid glass substrate, which they know how to process—then they could delaminate the high-efficiency cells and put them in any package. "We could de-couple growth constraints from a package of choice. You could select whatever you wanted as the ideal package at the end," Reese said. This concept was approved, and the project for the Navy began in August. To launch the exploration, Reese got creative. "I like arts and crafts," he joked. While there are a variety of ways—excluding razor blades—to remove cells that are a few micrometers thick, Reese and his team chose a method that uses liquid nitrogen. Once that step was completed, they used a "handle" that attaches to the cell, allowing them to put the cell on a flexible substrate. The team managed to demonstrate clean separation on small areas as part of the initial tests. That showed promise, but there's more work to be done. Reese and his team are optimistic—the idea of transferring these low-cost, high-efficiency solar cells to the types of flexible backings that could withstand field exposure is encouraging. "There are a series of different ways we can try to do this," he said. "We are investigating several approaches in parallel. We want to understand what needs to be controlled. What are the knobs we can turn to separate large area samples cleanly at a specific interface? How do we control fracturing in polycrystalline systems? What are the inherent limits to its flexibility?" If successful, the flexible, lightweight, high-efficiency, and reliable solar power will not only reduce the weight that a soldier needs to shoulder—it could also maximize military operational effectiveness in unmanned aerial vehicles and reduce the number of manned supply convoys. In other words, if this works, the NREL team could ultimately help the military ease burdens and save lives.